5 years ago on the 28th of November 2011 I sat on my bed with my netbook, a new page open in Blogger, ready to write my first post. My blogging journey began with a short stint on Youtube, where my original blog name freshbeautyxox *cringe* was born but when I discovered the world of blogging I knew that writing was the only thing for me. My first post was short and quite frankly didn't make much sense but it was something, I didn't know then but it was the beginning of a journey that would change my life for the better. I may have started out as a beauty blog but from the start it's always been about more than just the latest product in Boots, it's been an escape from the reality of the world around me. Blogging has gotten me through everything from my GCSEs to major surgery and I honestly don't know how I would have survived these past 5 years without it. My blog has helped me develop as a person, I know more about myself now than I ever have before, I know who I want to be and where I want to go. From the outside it probably just looks like a few fancy photos with some words enclosing them but for me blogging has always been more than that. I've grown up with my blog, if you've been here from the start then you will have seen me change from a spotty and shy 14 year old to the person I am today, a strong and resilient young adult. I've never taken for granted how much this little corner on the internet has improved my life and not just in terms of the opportunities I've gotten. I've made friends for life that I rush to when I have news to tell, friends who comfort and support me in rough times, not to mention the hundreds of people on social media who are there for me through the good times and the bad. It's no secret that I've struggled with my health a lot over these past 3 years and without my blog I fear I would have fallen deep into a dark hole, spending my days struggling to find the will to get out of bed. This platform though has enabled me to turn things around, using my experiences to raise awareness and support others. Someone asked me recently where I see my blog going in the future and honestly I'm not sure. The content I've been producing recently has left me feeling the most comfortable I've ever felt, for most of this year I've regularly struggled to blog but my new direction has left me with a renewed motivation. Talking about lifestyle and disability related topics is where my heart seems to lie but beauty posts will always be part of my blog, that will never change. 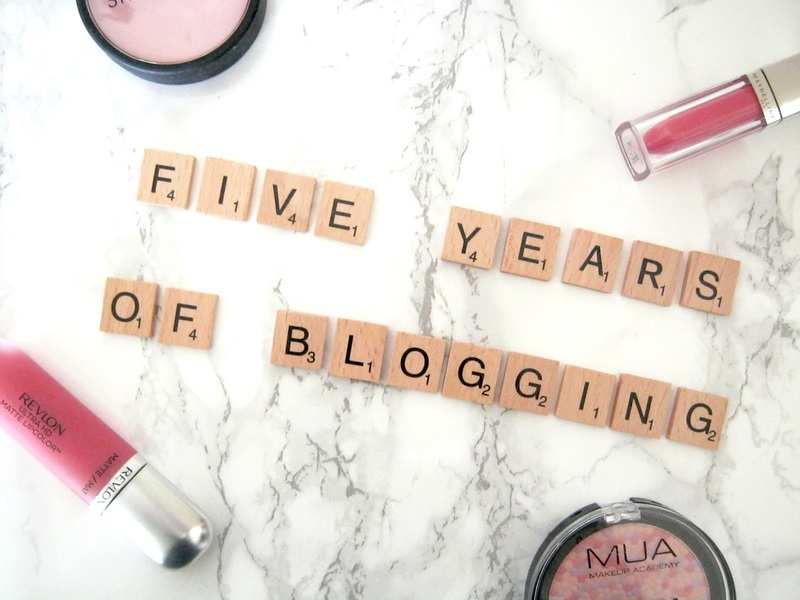 Looking back on the past 5 years I have only happy thoughts towards blogging, things have been bumpy here and there but at the end of the day I will always come back to my laptop, in seems that it is forever engraved in me to do so now.